I learned to sew as a child by my mother and her mother. Neither one was a quilter, but my father's mother was and I loved to watch her beautiful quilts come alive. She was gone before I took advantage of her knowledge, so I turned to the local Parks and Recreation department for classes. This was in the early 1970's, and I didn't love the templates and fabrics and so completely ignored traditional patchwork until the mid-1980's when Eleanor Burns and Nancy Zieman and Kaye Woods began to appear on my PBS station and entice me back to the quilting world. By the early 1990's, quilting was my main focus. I took a job working at my local quilt store in Denver, Great American Quilt Factory. It was one of the early stores in the quilting world, and the owners, Lynda Milligan and Nancy Smith, also published Possibilities books and Dreamspinners patterns. The constant exposure to so many talented quilters (co-workers and customers and suppliers) only further fueled my obsessive interest. I began to volunteer to help make store samples and book quilts and eventually found that most of my work week involved sewing as a designer. I learned SO much in those years, all the skills I hadn't had the nerve to try and well as the ones I thought I didn't have any interest in learning. It was a dream job. The only downside was that usually I was making what someone else wanted, not necessarily what I would have picked out. So I came home at the end of the day and hurried off to my sewing room to play with my ideas, colors, methods, etc. It certainly gave me lots of practice. 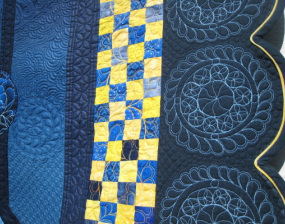 In 2002, I decided to try and enter my local guild's quilt show, The Arapahoe County Quilter's Festival of Quilts. I made a pattern from a book by Trudie Hughes called Shadow of the Bear. I changed colors and designed my own appliqué border and machine quilted it. It won the Best of Show award and I could not have been any more surprised! In 2011, Great American Quilt Factory went out of business and I found myself retired and sewing full time on the things I love. I now quilt mostly for shows. Friends and relatives have more quilts than they probably actually want and my house is well padded with quilts of all sizes. By making quilts for show I can test my skills and try to keep improving. I have been fortunate enough to win a some big awards and have my quilts published. The covers of Quilter's Newsletter Magazine in March/April of 2007 and October/November 2012 were a real highlight, as is the cover feature article in Machine Quilting Unlimited, March/April 2015. My latest adventure is teaching on-line for Craftsy/Blupring I have five classes up on line on their website -" Quilting Big Projects on a Small Machine" (just how do you handle a queen or king size quilt with a standard home sewing machine? ), one class called "Beyond the Basic Machine Quilting" (new stitches and techniques including several ways to handle feathers for the quilter who has just learned to free motion quilt and for the quilter who has been at it awhile but wants new ideas), "Playing with Curves" (all about curved piecing from basic to free form included paper pieced curves with my freezer paper technique), Continuous Line Quilting (about how to follow a pattern, or convert a pattern to continuous line techniques a well as many simple designs you can use) , and Small Machine, Big Quilts, Better Results (a new improved version of Quilting Big Projects on a Small Machine). You may also go to my Facebook site and follow my quilting life there:Username: www.facebook.com/ObsessiveQuilterAnnLPetersen. 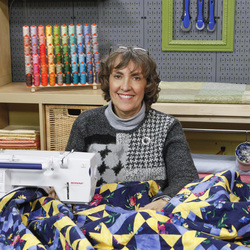 On the set at Craftsy while filming Small Machine, Big Quilts, Better Results.